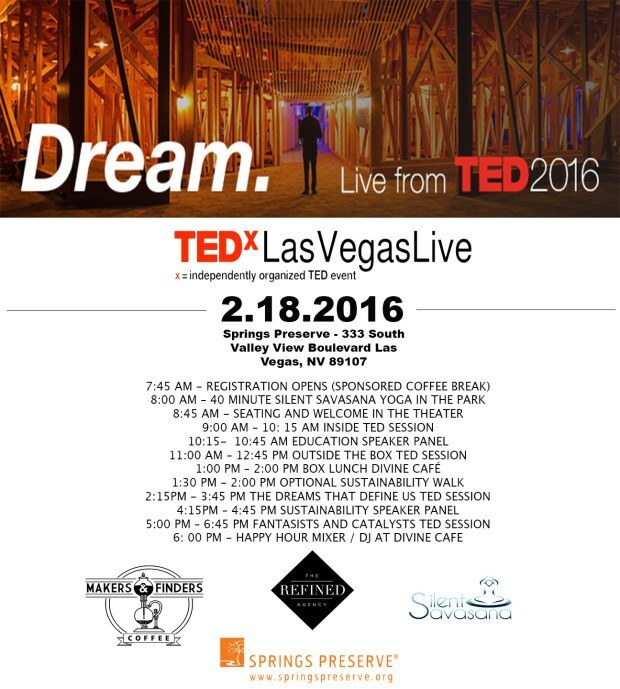 TEDx Las Vegas presents the official TED live viewing at the Springs Preserve Thursday, February 18, 2016. At this event, local community leaders and industry influencers will come together and the full day experience will be themed around Dreams. The event organizers will be streaming talks, and also feature two interactive panels focused on local topics in Southern Nevada. This event is designed as a benefit to help organize local resources for TEDxLasVegas. The organizer hope to set sites on putting on a Live Production event for TEDxLasVegas. Because of this, all funds raised go toward supporting and sustaining the TEDxLasVegas Program for the community. The night will cap off with an influencer reception at the Springs Preserve Divine Cafe. Grema says the event has been made possible by the support of many community partners, including The Refined Agency. For details on the speakers for the night, visit this webpage. To purchase tickets for TEDxLasVegasLive, visit the registration page here. The organizers have released a promo code for the VegasTech community – VegasTECH – and it’s valid for $40 off admission to TEDxLasVegasLive .